It's a good offer, But the panel is really basic, and my server crashed after 2 minutes, Hope you could fix that. Tried that, the VPS went automatically down after about 5min for some unknown reason (maybe it is intended to work this way). The panel is very basic, would like to see more options such as a 'Resource Monitor' tab and if possible add more avaiable OS in the list. Edit: After reloading the panel page I keep getting the following error: "Error: username unspecified"
(2017-08-17, 12:51:16 pm)Gries Wrote: Tried that, the VPS went automatically down after about 5min for some unknown reason (maybe it is intended to work this way). The panel is very basic, would like to see more options such as a 'Resource Monitor' tab and if possible add more avaiable OS in the list. Yes, the panel page does not seem to support reloading. After getting the username error, I needed to login again to see the panel. I don't feel it should be intended to shut down every 5 minutes. It does not make sense to do so, or the provider simply doesn't want to attract any potential customer. It seems that there are too many errors going on with this thread. I'm going to close this. Contact me OP if you want this reopened. So, this is pretty much the same as my previous thread. Due to personal reasons I was unable to maintain the previous service for several weeks, but I have added better abuse prevention and a good way to monetize the service. The "Free" plan now requires users to "mine" cryptocurrency in order to offset costs. For more info, see http://ronsorvps.us.to/mining.html. That. That is possibly one of the worst ways you could monetize your service. Especially for those with a system that can't handle it, you'd be doing a disservice to many possible users. There are plenty of ways to monetize your service. For example, a system granting a free VPS for completing Fyber or Peanut Labs offers. And for me, mining is not one of them. Why would anyone run the miner? It's stupid how you expect someone to leave the window open for an entire day. Not only does it slow down my Hackintosh, it burns around 90% of 4 cores. Keep in mind that this is a pretty powerful CPU - it's just not worth the few dollars for a VPS with no dedicated IP, no choice of OS and 1 measly gigabyte of storage. If anyone is in desperate need of a 64 MB VPS, I'll gladly pay. I don't want to see anyone use this rip off of a service. Even your paid plans are ridiculous; you're charging $3/mo for a NAT VPS with 128 megabytes of RAM. Why would anyone pay that fee if Vultr, for example, has a $2.50 plan with almost 4x the amount of RAM, a dedicated IP, V6 and more? I just don't get the purpose of this service. A free domain name coupled with expensive plans, a horrific free tier and awful control panel isn't worth it. It really isn't. It is really not a good idea to monetize it like this. Why in the world would people waste their time for 64 MB VPS? Actually nowadays, you can just do nothing 64 MB RAM. So is pretty useless. About your other packages, i do not understand that the prices are so damn high. So less RAM & Disk for $6/month, even though if i wanted to get a VPS from most trusted service, i would go for DigitalOcean and buy a droplet for just $5/month with so more RAM & SSD Disk. You have so many limitations such as "behind NAT; 10 ports (+ webserver and ssh port)"
I don't think that nobody would go for it. Please look at the market before offering so higher price. This is just my own opinion. If so big companies are providing a lot better resources than yours, then you must be changing it. 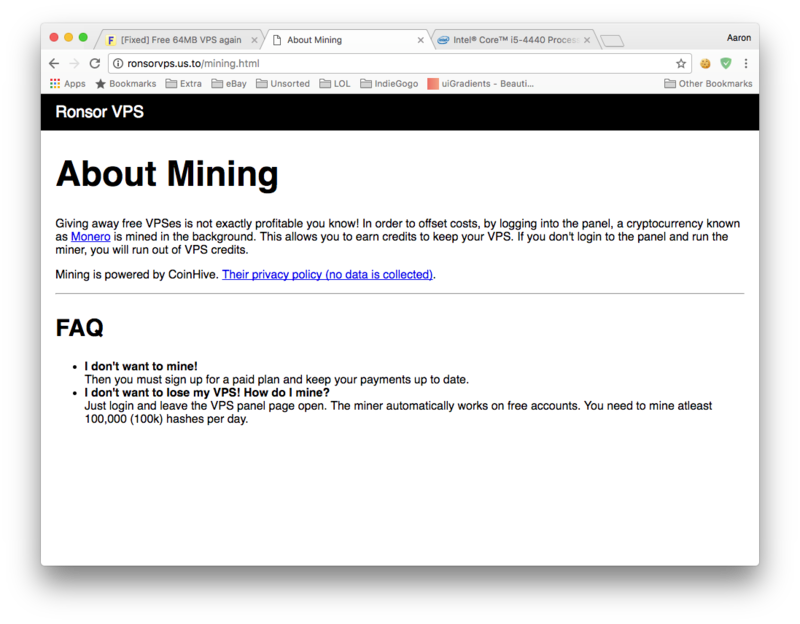 First I thought that we have to mine with the provided VPS. You can't really run it while using your computer, though, unless you limit CPU usage with an external utility. Current time: 2019-04-23, 7:14:06 pm Powered By MyBB, © 2002-2019 MyBB Group.